Today I have two topics to write about. The first is a bouquet, the second a brick. The Bouquet: I find it slightly bizarre, but commendable, that a country actively encouraging research into alternative energy should be the United Arab Emirates. The Zayed Future Energy Prize is awarded each year to Corporations, SMEs, NGOs and international high schools who are seen to be researching or implementing renewable energy options. Now what does that tell us about the future of oil? It’s generally understood by the world that oil, natural gas and coal (anything that must be mined) is a finite resource. Although there is some renewing of the resource over time, the eons of time it takes to be renewed is far outstripped by the rate in which our oil-dependent world is consuming it. Oil exploration is now reaching into less and less likely and more inaccessible places in a desperate bid to find new fields before the main ones run out. Of course, exploration is not altruistic. Scarcity will drive up prices so investors stand to gain huge profits by discovering one new source of oil or gas. But what are the alternatives – electricity? The Brick: In the US there are over 5000 alternative energy source patents that have been suppressed. (See this YouTube posting for reference – very important!) In the meantime, power companies (not just oil-fired generators) have introduced an appliance that could be harming our health irreversibly, and we’re just going along with it without question. The villain is the SMART meter. SMART meters are being installed world-wide, sold to us as power-price reducing devices that ensure accurate readings of our power consumption. Analogue meters, we are told, are inaccurate. They have been shown to cause fires (Read EMF reports) – In New Zealand, 422 fires involved smart meters in 2010. Having just viewed the film Take Back Your Power, I am horrified to realise our domestic power companies are going along with a device that has not been properly tested for safety. More than that, it’s designed to transmit power (radiation) impulses that can be picked up by power companies measuring power usage. Sounds a great idea. No problems with reading the meter and the company knows when to ramp up supply. On the other hand, the emission of radiation pulses continues even when the power company is not collecting the data; it continues night and day. And that’s when it starts affecting our health; everyone’s health, not just those who are susceptible to electro-magnetic pulses. So my plea to you is investigate for yourself, and if you don’t yet have a SMART meter insist that your power supplier respect your wish not to have one. If you do have a SMART meter ask your power supplier to take it out and replace it with an analogue meter – modern alternatives are available. If they won’t comply tell them you are going to change power suppliers. It’s better to reason with them and wear them down than try and find a new supplier, because the new supplier will want to hook up to the existing SMART meter. I enquired from Contact Energy and their fee for removing an existing SMART meter and replacing it with an analogue one is $110 NZ. I also had the call centre person register on our account that we do not want a SMART meter. She actually offered, so others must be requesting to be SMART meter-free. However, she did say we would receive mail explaining why they’re being installed once they get around to our area. In other words, they won’t take a blind bit of notice of our request to not have one installed and we will have to refuse again. Isn’t it wonderful to hear of efforts to put right the wrongs of humanity, especially when the wrong is committed against animals? What I particularly liked about this story is that the effort of the Elephant Transit Home in Udawalawe, Sri Lanka, to save and rehabilitate these baby elephants is enhanced by solar energy. 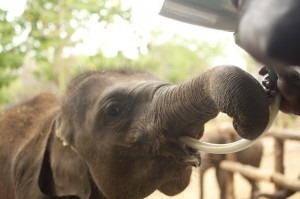 The initiative is supported by the conservation foundation set up by the Dilmah Tea Company and was triggered by the insatiable demand for firewood needed to boil umpteen litres of water used to make-up the baby formula for orphaned elephant calves cared for by the Elephant Transit Home. The search for firewood was draining in human resources because dead wood (the organisation ethically chose not to fell live trees) became scarcer and had to be fetched long distances. Also, the environmental damage of carbon-dioxide released into the atmosphere from burning large quantities of wood to boil the water did not sit well with the home. To find out more about this heart-warming story click the link or copy into your browser address bar.